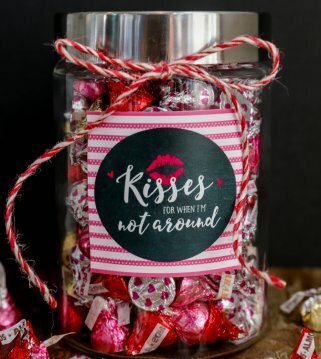 A collection of unique and cute valentines box ideas to make for class parties, home or fun. 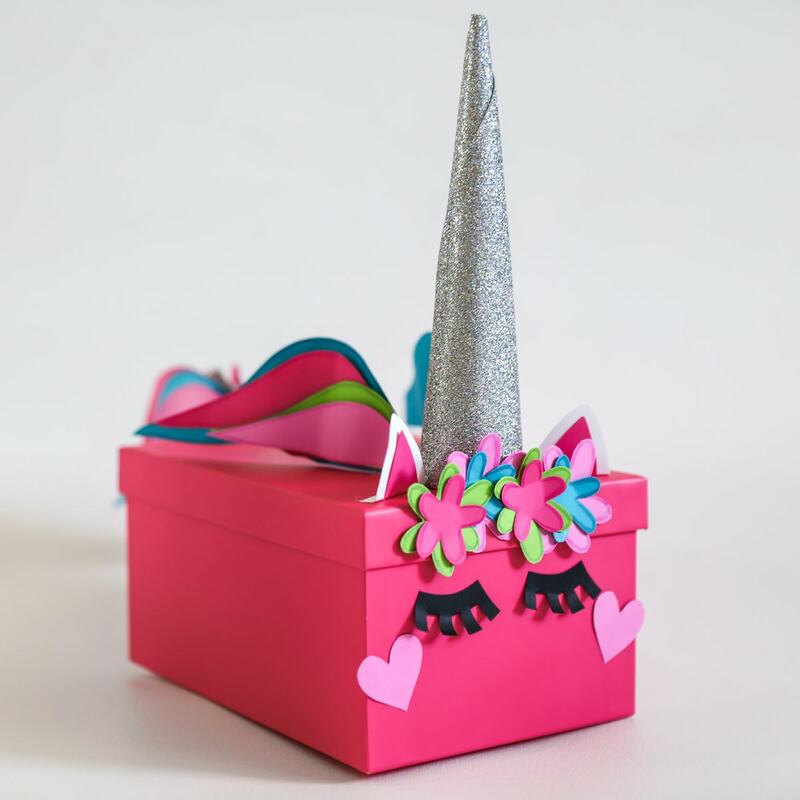 From a unicorn box to a robot box, there are fun box ideas for everyone. Who doesn’t love Valentine’s Day?! It’s been one of my favorite holidays since I was a child and is one that my own children love. 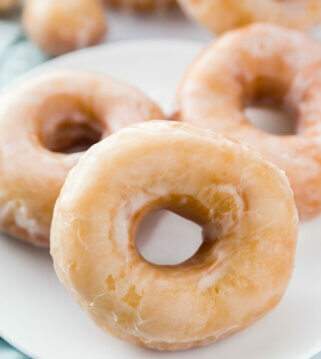 Maybe it’s the candy, maybe it’s the hearts, but I think my kids would say that the school Valentine parties are their favorite. 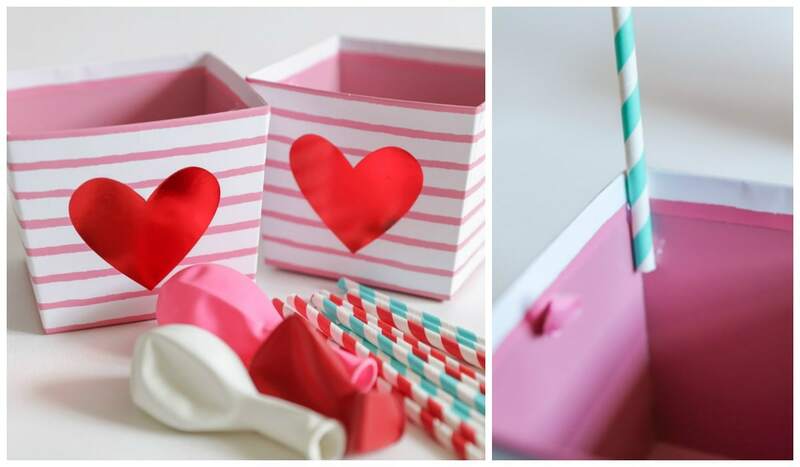 It’s become tradition to make Valentine’s Day Boxes for school or home parties, and this year is no different. With 5 kids in pre-school or elementary school, we had a variety of box requests that include a unicorn, hot air balloon, dinosaur and robot. To get all the supplies to make these boxes, we headed to Michael’s knowing very well that they would have all the supplies needed to make these unique valentine box ideas. 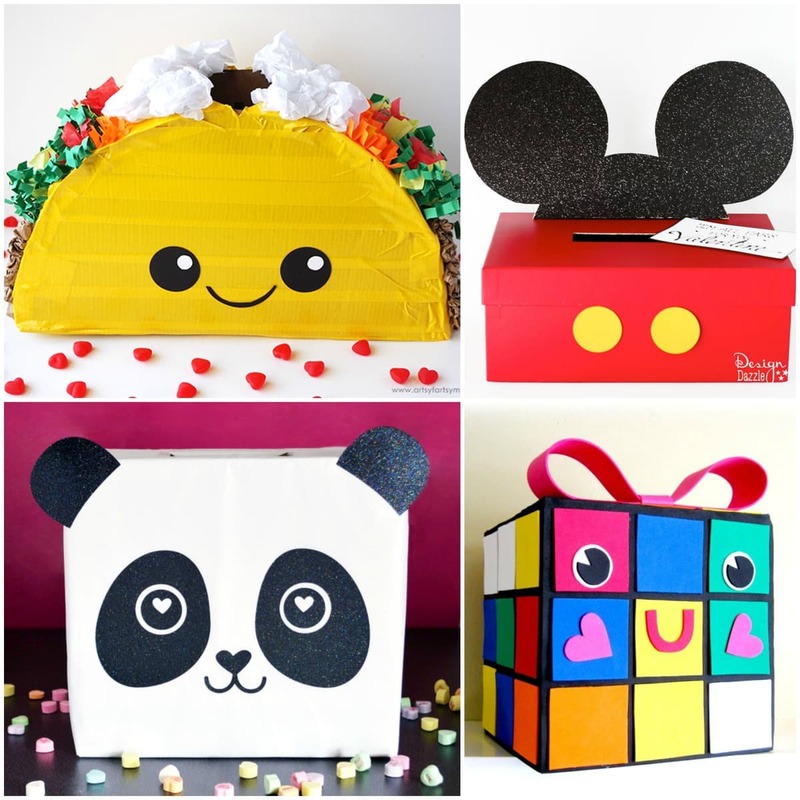 With their products, we were inspired to make some awesome boxes that were simple and creative! I think it’s safe to say that most little girls are obsessed with unicorns. They’re sparkly and magical, and it’s the box requested by our 4 year old. We wanted to keep things simple and were so glad that Michael’s carried card boxes that already had a slit at the top for valentines. With some card stock, scrapbook paper and a hot glue gun we got to work in creating this easy unicorn that was made in under an hour. 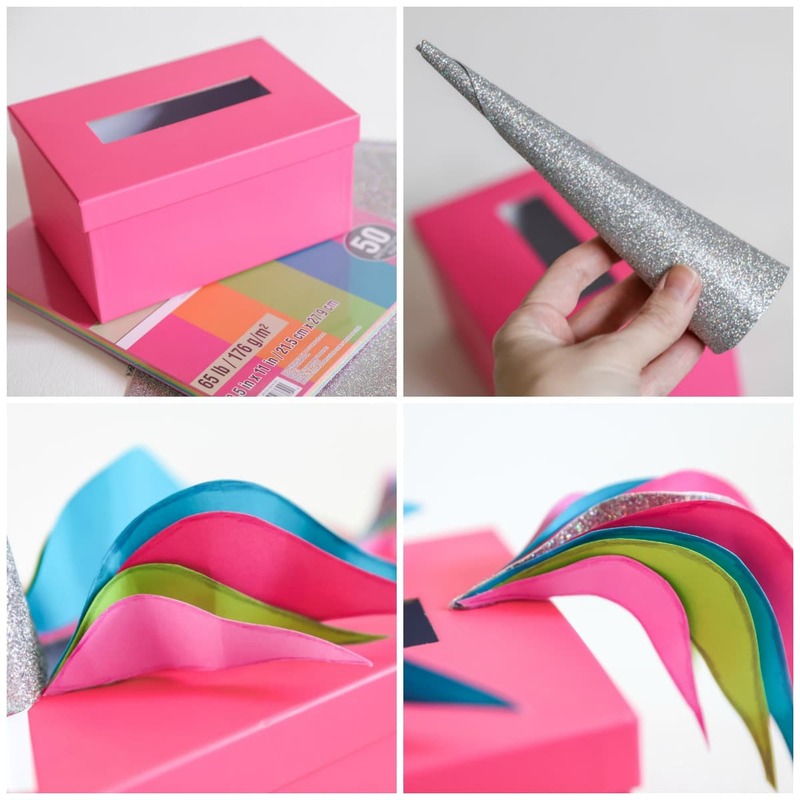 To begin, make the unicorn horn by using some glitter scrapbook paper. 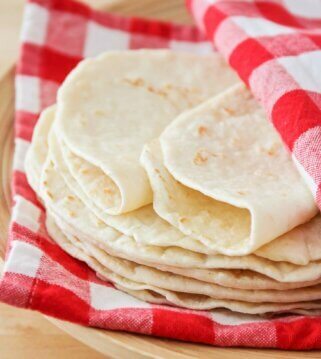 To do this, roll from the corner of the paper into a cone shape. Hot glue and cut off the excess to make it the size you want. Hot glue this to the top of your box. Make hair to go behind the horn as well as hair for the tail by cutting out pieces from different colors of paper. Hot glue these together and then to the box. Cut out eyes, cheeks, ears and flowers to add to the box as well. Add any other accessories to complete the unicorn box. As you can see, it’s very simple and can be modified to your liking. They also had red and white card boxes if you want to change out the color of the unicorn. 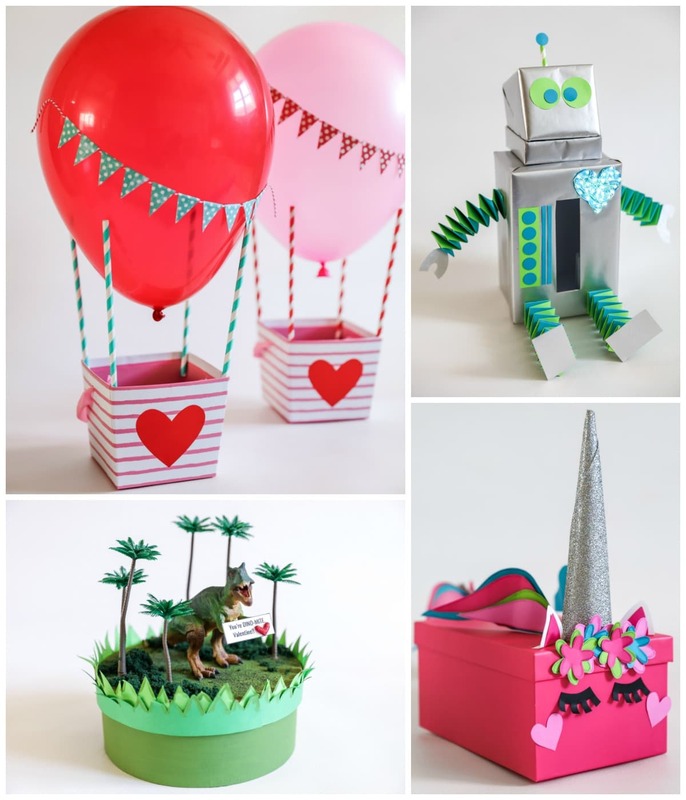 The most simple of the boxes were the hot air balloon valentine boxes. They took about 20 minutes to make and were also made with simple supplies from Michael’s. 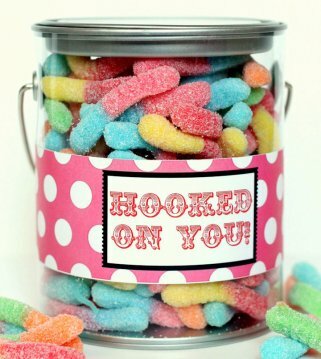 If you are looking for a quick and cute idea, this is definitely the one to choose. 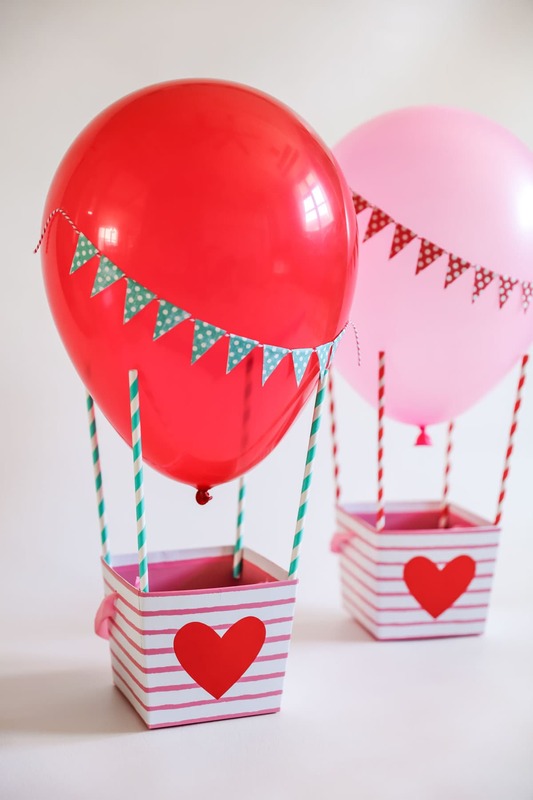 We also loved that Michael’s carried these cute heart paper pails which made for the perfect base for our hot air balloons. Adding any accessories to the balloons is optional, but we loved the paper pennant banner we made. To make this, fold a scrapbook paper in half and cute triangles on it with the base at the fold. Hot glue pennants to a piece of twin. Attach to balloon using glue dots. Hot glue straws into the corners of the paper pail making sure they are all at the same height above the base. The balloon will rest on the tops of the straws. Blow up balloon and place in the middle. Adhere the ballon by adding a glue dot to the top of the straw as well as a glue dot to the balloon where it attaches. And, that’s it! 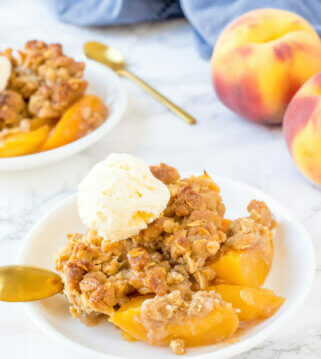 So easy and quick and a cute idea! Creating this dinosaur valentine box was easier than you’d think. Michael’s carries an assortment of dinosaurs along with all the makings for an amazing diorama. 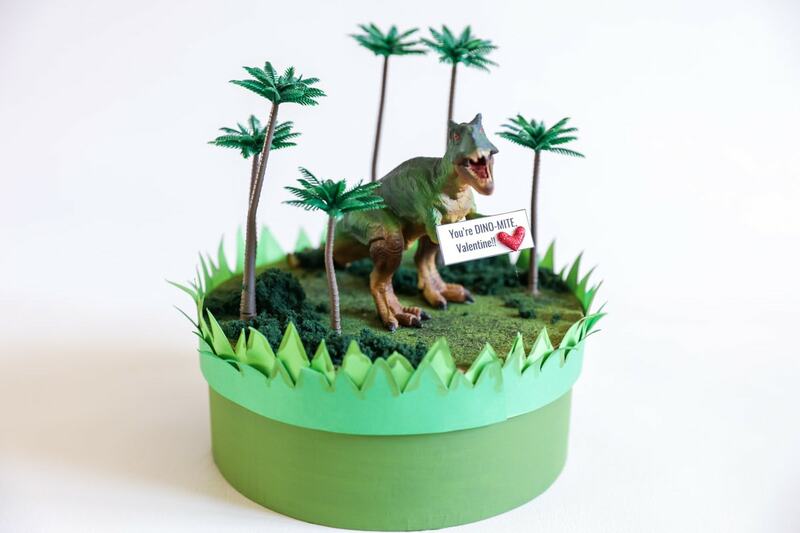 With a few of these supplies and a simple round paper mache box, we were able to create another simple valentine box that is perfect for any dinosaur lover! What’s great is you can also change it up based on the dinosaur and foliage you use to make it completely custom. Round Paper Mache Box – 7 inches. To begin, attach the vinyl mat grass to the top of your box. 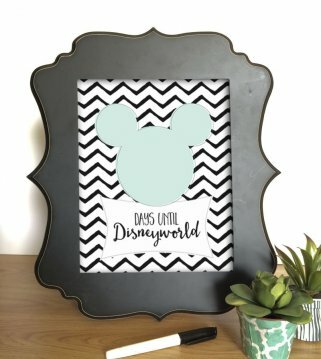 Also add any palm trees or foliage and hot glue on. Attach the dinosaur to the middle and make sure it is secure. A kid will most likely use the dinosaur to pull the lid on and off, so it needs to be on there vey securely. 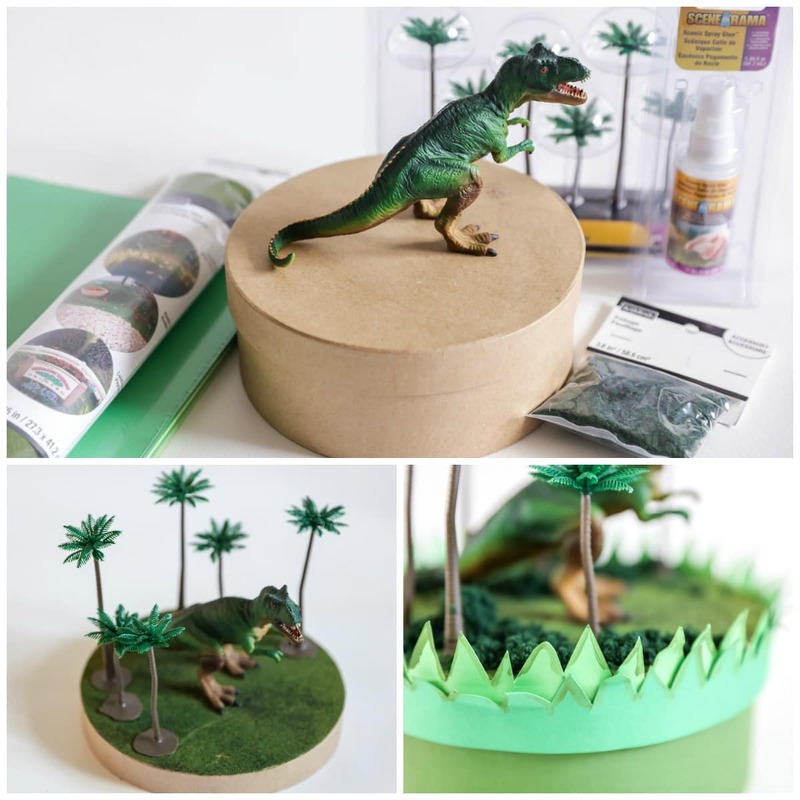 Cut out cardstock in the shape of grass and hot glue to the rim of the paper mache box top. Pain the bottom of the paper mache box. 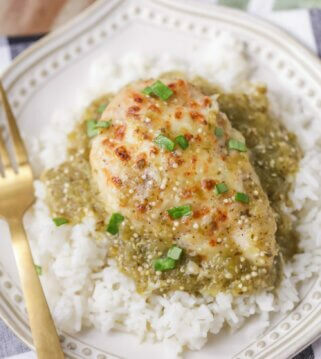 We used hunter green. To add a cute touch, we printed out on cardstock “You’re DINO-MITE, Valentine!” and hot glued that to the T-Rex’s hands. 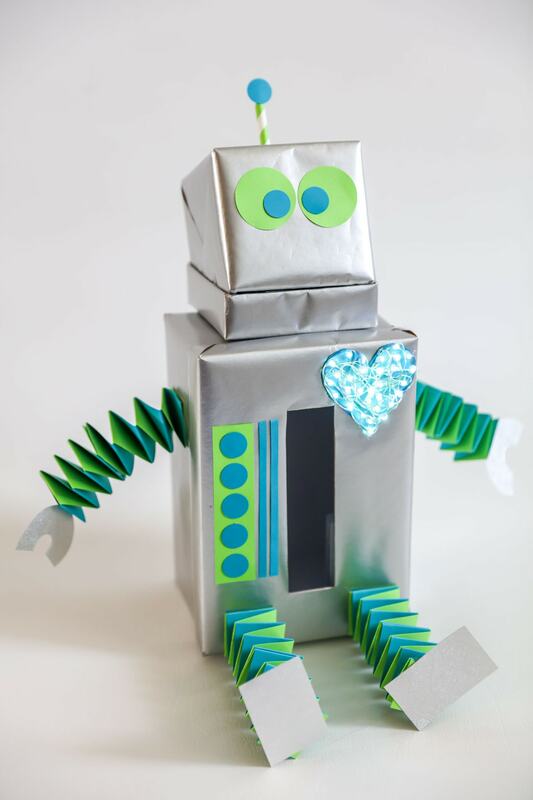 The most time-consuming of the boxes was this Robot Valentine Box. It’s still very simple, but took a bit more time because we ended up wrapping the box and lid in silver wrapping paper. Another option is to buy silver craft paint or spray paint which may be easier if you don’t like wrapping but still takes time to paint and let dry. We were also able to add some fun accessories like the moon light sand accordion arms and legs. As always, this can be changed out based on what accessories you add as well as the colors you use to decorate the robot. Begin by wrapping your boxes in silver wrapping paper. The box and lid can also be spray painted silver or painted silver with craft paint. 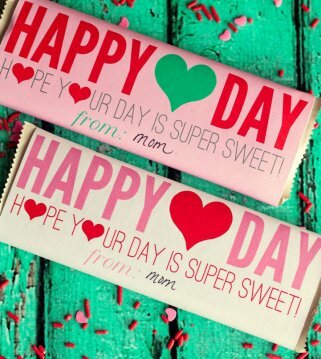 Be sure to cut out the slit the valentines will go in with an X-acto knife. Hot Glue the smaller square box to the top of the card box (NOTE: We wanted the lid of the square box to look like a slit for the mouth, so we hot glued that at an angle before gluing it to the card box). Add any accessories you want that will include the heart, buttons, eyes, top antenna, etc. For the lights, we just hot glued this to the heart and zig-zagged it all over for it to look wire-y. 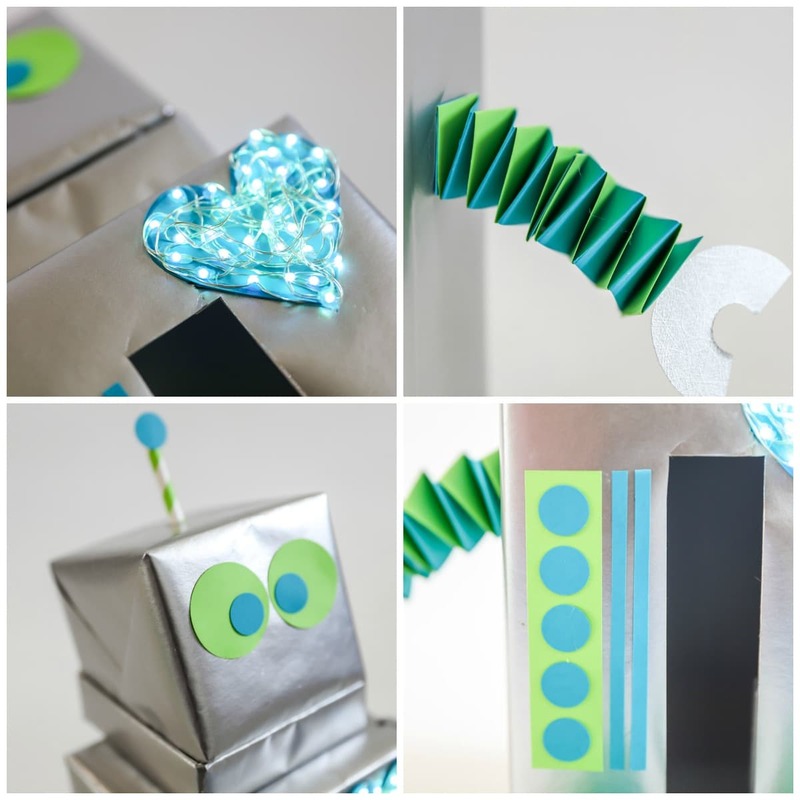 We also created arms and legs by cutting 1 1/4″ wide paper strips from blue and green paper. We hot glued these as an L and then crossed the papers back and forth over each other to create an accordion. Hot glue these to the sides of the box and add any hands and feet desired. 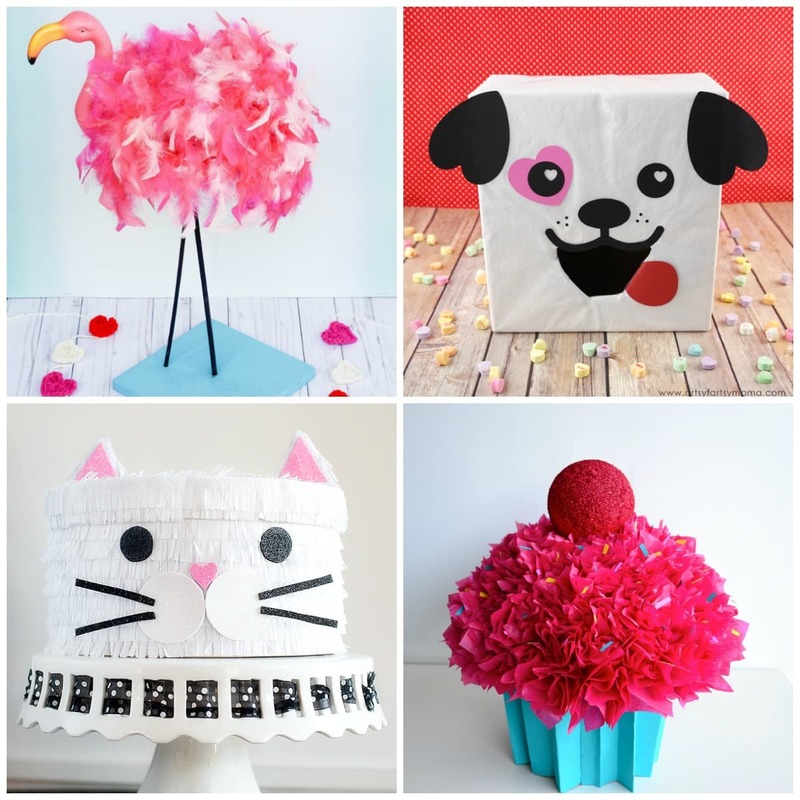 We know that the possibilities are endless as to what can be created for Valentine Boxes, but wanted to share a few more ideas with you from around the web. 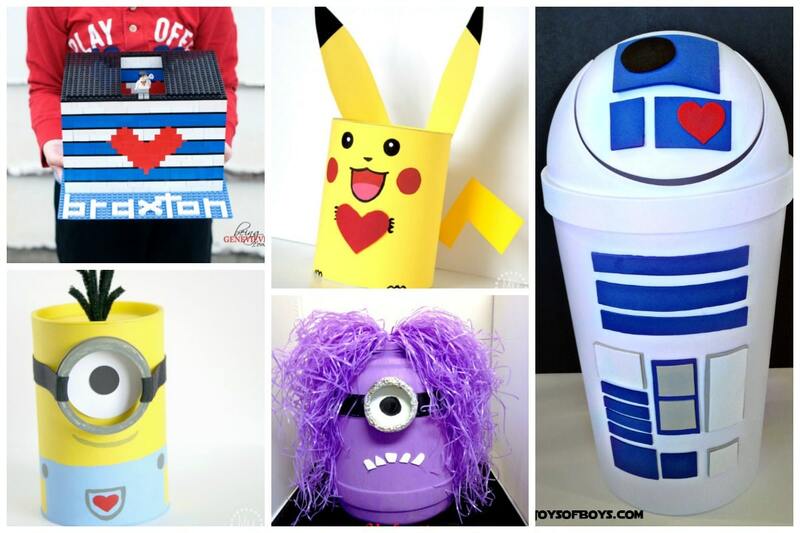 There are so many great Boy Valentine Boxes all over the blogosphere. 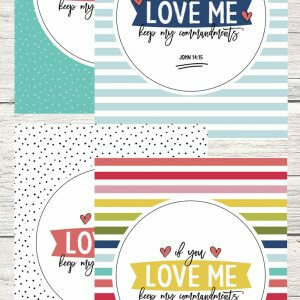 Here are some of the favorites we rounded up that are creative, unique and perfect for Valentine’s Day! 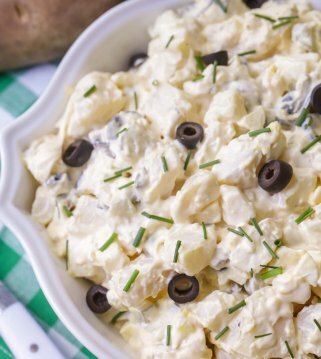 So many great ideas to try out for the 14th! 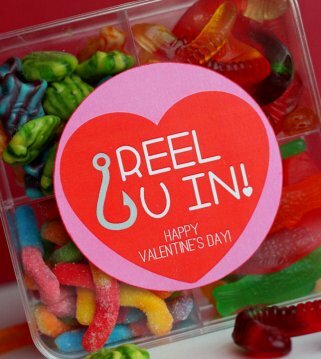 We also wanted to share some of our favorite Girl Valentine Boxes. 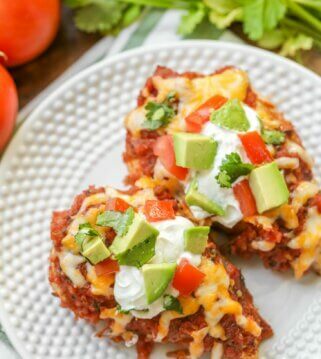 These may be a little more cutesy but perfect for any upcoming class parties! Such fun ideas!! That Kitty Cat and puppy have to be my favorites! 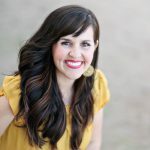 Seriously – SO many amazing ideas!! 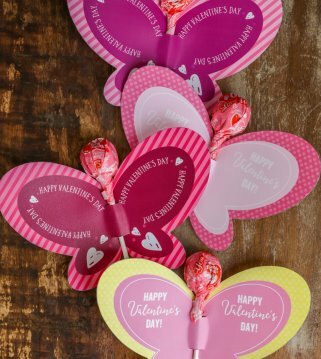 We hope you were able to find some inspiration here and that you head to Michael’s for all your Valentine’s Day needs. For more information of what they have to offer for Valentine’s Day, GO HERE.